This article is about the indoor arena located in London. For other uses, see O2 Arena. The O2 Arena is a multi-purpose indoor arena located in the centre of The O2 entertainment complex on the Greenwich Peninsula in southeast London. 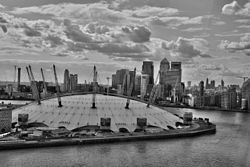 The arena was built under the former Millennium Dome, a large dome shaped building built to house an exhibition celebrating the turn of the third millennium; as the dome shaped structure still stands over the arena, The Dome remains a name in common usage for the venue. The arena, as well as the total O2 complex, is named after its primary sponsor, the telecommunications company O2. The O2 Arena has the second highest seating capacity of any indoor venue in the United Kingdom, behind the Manchester Arena, and took the crown of the world's busiest music arena from New York City's Madison Square Garden in 2008. The closest underground station to the venue is the North Greenwich station on the Jubilee line. Following the closure of the Millennium Experience at the end of 2000, the Millennium Dome was leased to Meridian Delta Ltd. in December 2001, for redevelopment as an entertainment complex. This included plans for an indoor arena. The seating arrangement throughout the whole arena can be modified, similar to the Manchester Arena. The ground surface can also be changed between ice rink, basketball court, exhibition space, conference venue, private hire venue and concert venue. On 21 July 2007, British rock band Keane played the arena as part of their Under the Iron Sea Tour, and the performance was later released as their Keane Live DVD. From 2008, the O2 Arena has hosted Capital's Jingle Bell Ball which is an annual minifestival held over two nights usually in early December. Since 2009, the arena has hosted the prestigious ATP World Tour Finals, the season ending finale of men's professional tennis, featuring the top eight players in the world. In 2015 it was announced that the tournament would extend its deal to hold the tournament until 2018. The venue has hosted the event for the second longest tenure, behind only Madison Square Garden (1977–89). During the 2012 Summer Olympics and Paralympics, the venue was referred as the North Greenwich Arena due to Olympics regulations regarding corporate sponsorship of event sites. Ariana Grande was scheduled to perform on 25 and 26 May 2017 as part of her Dangerous Woman Tour, but the event was cancelled after the Manchester Arena bombing on 22 May. The event was not rescheduled. Since March 2013, the arena has hosted C2C: Country to Country, Europe's largest country music festival, which annually attracts over 20,000 fans. UK and Irish acts as well as up-and-coming American acts perform sets several times across various pop-up stages in and around the arena, with the main stage accessible only to ticket holders. The seventh C2C was held on 8–10 March 2019. Despite being open for only 200 days per year (the equivalent of seven months), the venue sold over 1.2 million tickets in 2007, making it the third most popular venue in the world for concerts and family shows, narrowly behind the Manchester Arena (1.25 million) and Madison Square Garden in New York City (1.23 million). ^ a b "Transforming a tent into the World's favourite venue". Populous. Retrieved 13 February 2018. ^ White, Dominic (15 April 2008). "The Lemon Dome That was Transformed into O2's Concert Crown". The Daily Telegraph. Retrieved 7 May 2011. ^ "New life for Millennium Dome". news.bbc.co.uk. 18 December 2001. Retrieved 10 October 2017. ^ "Dome sleeps 700 over festive week". BBC News. 28 December 2004. Retrieved 27 January 2014. ^ "wins contract at O2 Arena". Audience Systems. Retrieved 7 May 2011. ^ "Dome's hi-tech refit for The O2". BBC News. 21 June 2007. Retrieved 25 May 2010. ^ "O2 Arena forced into Olympic rebrand following sponsor clash". brandrepublic.com. ^ "TOP 200 ARENA VENUES 2017" (PDF). 31 December 2017. 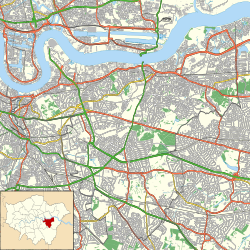 Wikimedia Commons has media related to The O2 Arena.